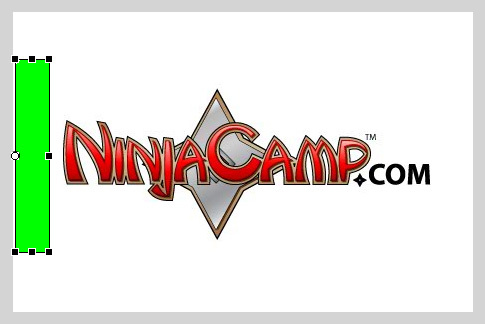 Hi everyone, welcome to another NinjaCamp Flash tutorial. This time around I'll be writing about the masking process in Flash. We'll be using masks on the timeline, the easiest way to mask content. 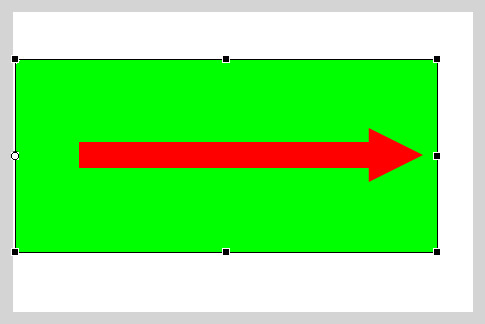 Soon I'll write a more advanced article about dynamic masking with Actionscript 3. Let's get started! First, the basics of masks. We use masks when we want to hide part of something on the stage. In other words, we mask parts of an object. Normally this isn't very exciting, but the real benefit of masks come in when you animate them to produce cool effects in Flash. This has a lot of applications- gaming, information design, web content, you name it. 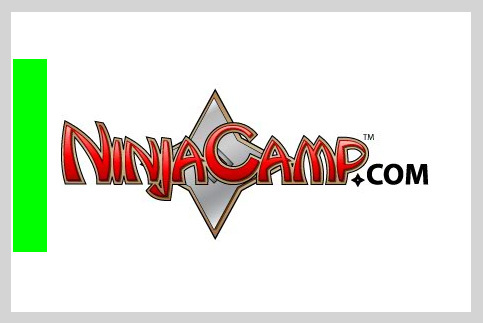 They are very commonly used and you should add them to your Flash toolkit. Now common sense might tell you that the mask would cover and hide whatever it's over, so why did we move it off to the side if we want the logo hidden to begin? Well, Flash works in a counterintuitive way with masks, the areas of the masked content which are covered with the mask will be visible. So, to completely show an object the mask must cover the object completely. No problem! the next step is to make our mask a MovieClip so it can be animated easily. Some people use shape tweens for this but I like the flexibility of using the same mask elsewhere in my movies. Select the mask artwork on the stage and press F8, or in the menu "Modify > Convert to Symbol...". 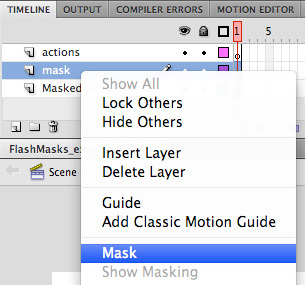 Name the symbol "myMask" or something similar, make sure type is set to Movie Clip and press OK to close the dialog. On the stage, your mask should now be a MovieClip object. Good work! All done! You can either lock the "mask" layer and scrub the timeline to see the effect, or just test your movie by pressing Command/Control and Enter. Pretty cool! Try and think of some interesting things you can do with masks, and I will follow up with some more advanced techniques in later tutorials. Take care!